Educational, Engaging, Elementary (and Middle School, Too). 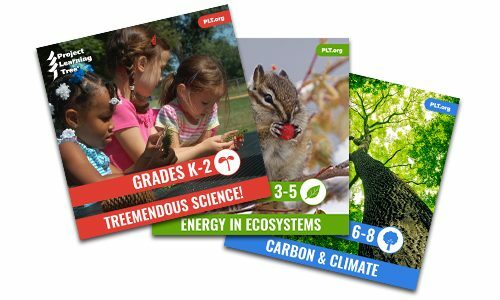 PLT is excited to announce the launch of three new e-units: Tree science for K–2, energy in ecosystems for grades 3-5, and climate change for grades 6-8. These new units are available online to educators across the country, just in time to plan for the upcoming school year. Educators familiar with PLT’s existing PreK-12 activity guides will recognize the rigor, creativity, and depth that characterize all PLT materials, along with additional features that respond to what many teachers have expressed they need in their classrooms. For example, the e-units offer teachers the option to present individual lessons, from 5 to 7 per unit, as part of a more comprehensive curriculum. They are designed around the 5-E Instructional Model (engage, explore, explain, elaborate, and evaluate). links to websites, videos, and other supplementary resources. Building on PLT’s strengths, the e-units address standards in multiple subject areas: science, social studies, language arts, and math. They are extremely flexible, and they engage students in hands-on, relevant learning. PLT’s e-units are constructed around—rather than correlated to—targeted Performance Expectations within the Next Generation Science Standards (NGSS). In other words, rather than develop a curriculum and later try to make the correlations fit, PLT began with the standards and NGSS’s three-dimensional approach in the initial design. As a result, the e-units are constructed around targeted performance expectations of the NGSS. In addition, the e-units are aligned with two other academic benchmarks: Common Core (ELA and Math), and The College, Career, and Civic Life (C3) Framework for Social Studies. Within the e-units, the alignments for all three sets of standards are made explicit for teachers and displayed visually via an innovative and interactive web-based tool. Many state standards use the national benchmarks as a basis for their own individualized standards of learning. With an appropriate level of understanding and professional development, teachers and administrators will easily be able to draw connections between the national standards and their state subsets. PLT’s e-units also offer opportunities for teachers to personalize and localize student learning. Teachers are invited to replace certain pre-prepared example information with their own history about a specific region or landscape. This opportunity exists in each e-unit, and allows teachers to incorporate additional state-specific standards into their teaching. The pre-prepared examples also provide excellent templates for teachers to emulate. For example, Carbon & Climate (grades 6–8) begins with students understanding what climate is, before moving on to exploring the carbon cycle, causes of climate change, and the impact of individual actions. Given the highly charged debate around climate change, teachers expressed their support for the fact-based approach of the e-unit. The e-units’ flexible, supplementary materials can be modified to fit not only individual classroom needs, but also the needs of individual students, including English-language learners. For example, having the student content available online allows teachers to use online software, such as free text-to-speech applications, to read content aloud to students with different developmental language levels. “I honestly found the unit resources to be among the most well-organized resources I have ever used,” said Agnes Zellin, a New York teacher who pilot-tested the Energy in Ecosystems e-unit for grades 3-5. As with all PLT curriculum materials, the three e-units underwent a thorough review. More than 400 educators applied, and nearly 100 educators participated, in e-unit pilot tests and practitioner reviews. The selection process ensured geographic, grade level, and demographic representation. PLT used the feedback in final revisions to ensure that the materials are as student-ready and teacher-friendly as possible. Teachers expressed support for packaging the materials as cohesive units, rather than individual lessons. Those who focused on Treemendous Science! (for K-2) further said they appreciated its separate levels for different classes or student abilities, each geared for a specific grade level. Yet they also agreed that the levels be packaged as one unit over individual, separate entities. Two of the e-units are available now— Energy in Ecosystems for Grades 3–5 and Carbon & Climate for Grades 6–8. Treemendous Science! for K–2 will be available in September. Teachers can receive the materials by attending a professional development workshop offered in their state, or by participating in online training ( see separate story ). Contact your state PLT coordinator for more information about workshops in your state or access online training through the PLT website. If you want a sneak peak of our new e-units, check out this video. Project Learning Tree is in the process of creating several new online lessons designed specifically for classroom teachers in Grades K-2, 3-5, and 6-8.